Floriculture is a sector which has the potential to revive rural economy in Sikkim, said Somnath Poudyal, Minister for Food Security and Agriculture Development. 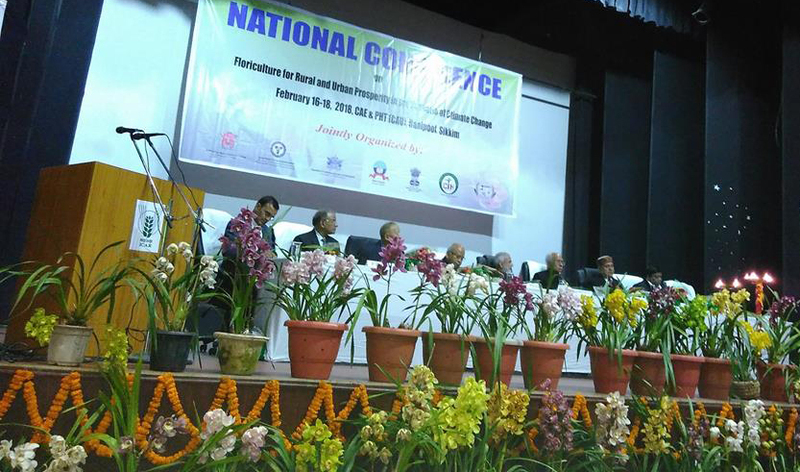 He spoke at the inaugural ceremony of the three-day National Conference on ‘Floriculture for Rural and Urban Prosperity in the Scenario of Climate Change’, on Friday. The three-day conference started on February 16 and concluded on 18th. Speaking at the inaugural ceremony of the conference, Minister for Food Security and Agriculture Development, Somnath Poudyal, said that floriculture sector has the most potential to improve rural economy given a conductive climate. “Sikkim, in particular, has a highly conducive climate, tradition of growing flowers, market opportunities, peaceful environment, stable and pro-active government and policy support giving a strong edge to floriculture in the State. It is seen that floriculture is becoming an attractive venture,” Poudyal said. The Minister has also expressed concern over the fact that, due to global warming, some indigenous species of flowers has become endangered. The climate was not conducive for the growth of the endangered flowers. “Some of the Himalayan regions may be deprived of normal precipitation due to unusual monsoon and erratic rainfall pattern. To minimize the effect of climate change, use of green-house technology, hi-tech horticulture are some of the solutions,” Poudyal said.